From the 1928 silent film The Viking, whose true star is Natalie Kalmus, responsible for the technicolor. Cross-posted on In The Middle. Go there to leave comments, if you want. C’est ridicule, ce nom a toujours existé. Personne n’en veut aux juifs, bien sûr….Pourquoi changer un nom qui remonte au Moyen Age, ou à plus loin encore ? Il faut respecter ces vieux noms. It’s ridiculous! This name has always existed. No one has anything against the Jews, of course ….Why change a name that dates back to the Middle Ages, or even further? We have to respect these old names. One of these claims may be true: for what it’s worth, the name does appear on an eighteenth-century Cassini map (pictured), and it’s recorded as early as the seventeenth century. The hunch that Jean le Bon may be responsible for the name strikes me as probably correct. The story caught my eye because of the matter of heritage. Next month, I’ll be speaking at a symposium on Heritage in Transcultural Contexts. 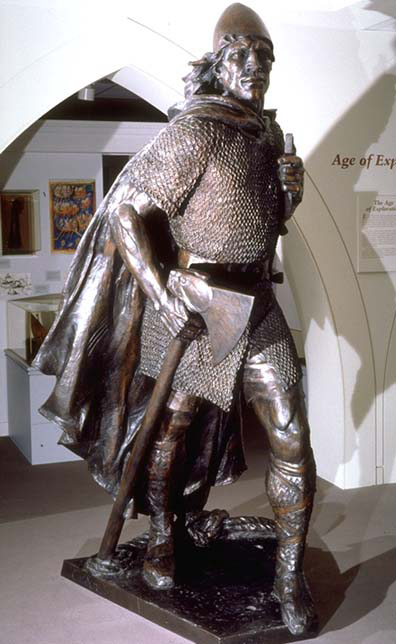 I’ll be talking about the North American afterlife of the Norse encounter with the Americas. I’ve read (Brooklyn College alum!) Annette Kolodny’s In Search of First Contact, and some other good work (Frakes; Mancini; and our own Jonathan Hsy’s Kzoo14 paper on disability and the sagas). 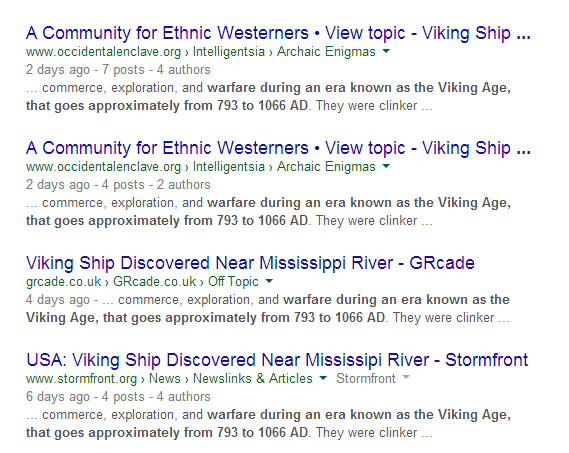 Why the love for these people, generally, and disturbingly, called “Vikings” (despite their being on what was, clearly, a trading rather than raiding mission)? Why the frequent references to them as “blue-eyed” (here or here or here or here) or “yellow-haired” (here)? 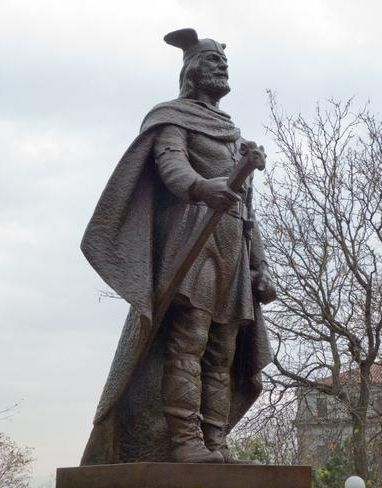 Why the emphasis on the Nordic freedom in the democratic Thing, and why the argument that the Norse were free of the despotism of Catholicism? 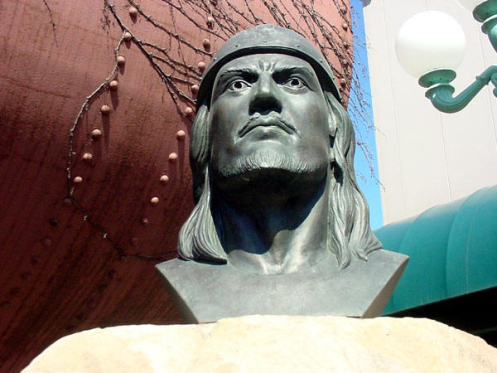 Why the sense that North American history, proper, begins with the arrival of the Northmen? 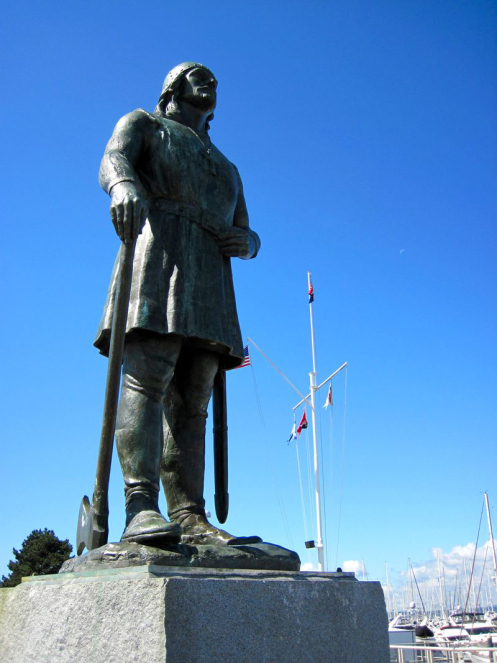 And why the emphasis on Leif Erikson, far from the most important figure in the Icelandic family sagas? 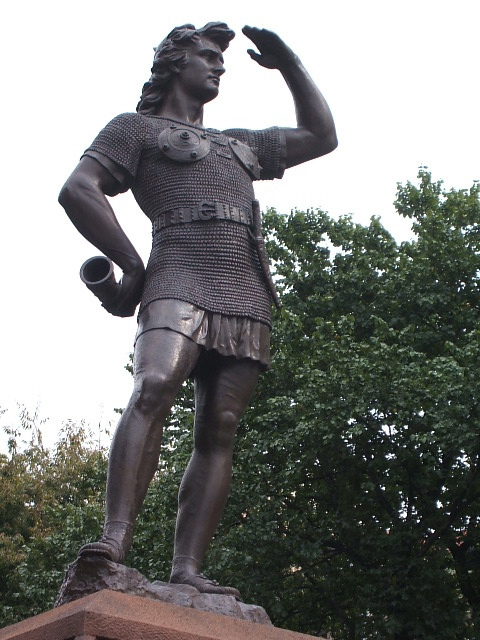 The answers may all be obvious, but remember that I’m speaking to a crowd of nonmedievalists. My interest will be in the more negative aspects of “heritage,” in part my own (given my own family roots in midwest Scandinaviana: whatever the other lines, my mother tended to identify as Swedish, and my father Norwegian), and in part that of White America, especially in the North. I’ll be complicating questions of time, belonging, and, I hope, whose violence gets to count as “historical,” and who gets to count as a victim. 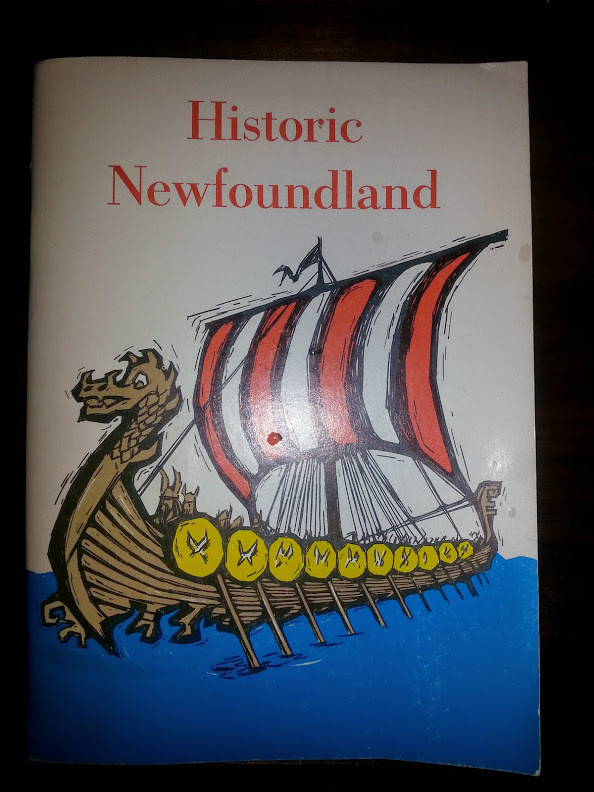 The only unarguably authentic archaeological remains of the Norse in the Americas is on a Northern tip of Newfoundland, at L’anse aux Meadows, discovered in 1960, and now designated as one of 1007 UNESCO World Heritage Sites (but also see). 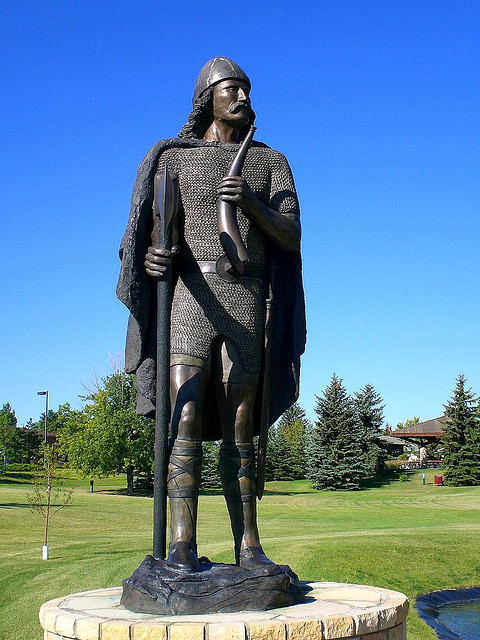 It is one of 17 in Canada, 7 of which, including this one, memorialize a specifically human activity or culture. 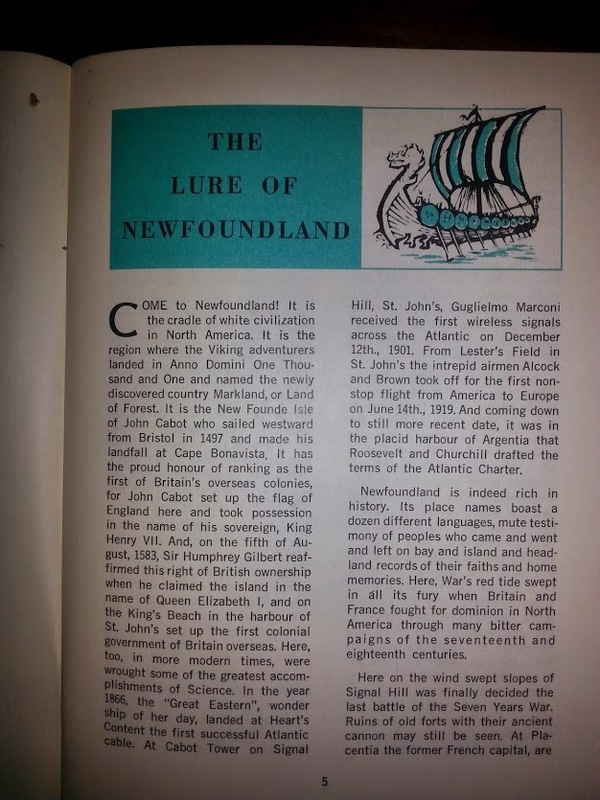 UNESCO’s designation guidelines explain how heritage officially works: primarily, items must have an “outstanding universal value,” “so exceptional as to transcend national boundaries and to be of common importance for present and future generations of all humanity.” I am, however, interested in the local rather than the universal qualities of heritage. While heritage sites may need to claim a universal interest, a heritage designation requires a choice and a boundary, a separation from universal generality: heritage sites exist and indeed justify themselves first only through particularity. I’ll offer four working proposals on this point. Second, heritage identifies a particular segment in time as the antique moment worth preservation. Generally, antiqueness provides its own justification. What counts as “antique” depends on the historical consciousness of the defenders or even the generators of heritage. It may be sufficient that the site or practice seems “old,” and that it be thought to have just emerged organically or communally, without any particular choice being made to get it started. Here’s two examples of how this works, selected as representative, universal examples rather than for their particularity. The first is from a case in Florida of a mother accused of kidnapping her own daughter: she’s a neo-Confederate and gun nut, fond of taking pictures of her two-year-old with boxes of ammunition. When a Family Court judge challenged her on this, she explained “We have a heritage; we have a tradition.” The language comes from images like these (FLAG IMAGE), which I poached from, of all places, americanheritagecommittee.com. To say something has heritage is to place it outside argument. It can’t be reasoned with; it must be respected. Its existence is its own argument. And its existence is an existence across time that erases time as a succession of differences. Second example: recently, in the Loire valley, efforts are being made again to change the name of a clutch of two houses and a farm to something less objectionable than La Mort aux Juifs, “Kill the Jews.” The responsible party, the mayor of Courtemaux, refuses, saying that it was already tried 20 years ago, and, anyway, the name has the aura of heritage: “It’s ridiculous! This name has always existed. No one has anything against the Jews, of course ….Why change a name that dates back to the Middle Ages, or even further? We have to respect these old names.” So far as the mayor’s concerned, no one can be responsible; rather, the blame is laid on the Middle Ages, which is to say, the case has been passed on to another judge, that of Time Immemorial, and Time Immemorial has judged the case as one might expect. I’ll propose that few times are more Immemorial than the medieval. This era, whenever it was, tends to function as paradoxically older than both the modern and classical eras, since, at least for Western Europe, it’s the oldest time that could conceivably still be attached to the present. Other times might be forgotten, but the Middle Ages still offers a connection. The Middle Ages, after all, is where the moderns like to imagine their national, religious, and linguistic boundaries arose (here; here; and, without any endorsement, here). And, at least to nonmedievalists, it’s a time that is less known than both the modern and the classical eras: who knows what people were up to in those dark ages? Generated in particular sites, without the universal claims of the classics and the moderns, the medieval tends to stand for low rather than high culture, local rather than international tastes, organic rather than cultivated habits, tradition rather than choice, and at once as a point of origin and a sign of a forgotten foundations. And it’s all the more sure for that, as the forgotten origin has the ontological reality of things that are “just there.” It’s where people, some people, find their roots. Third, a “heritage site” is a site it is at once distant, as a foundational moment in the past, and also here, in the present, identifiably connected with this past point to such an extent that it can barely be separated from it. This is the key temporal paradox of “heritage”: not only that the heritage point has to be selected arbitrarily — frozen, purified, and walled off — but also that the heritage has to have existed at some point in the past, but that it still has to be here, having repeated itself with minimal change across time and space. A heritage site offers immediacy. Connection. A heritage site offers an origin without a difference, or even an origin without an origin. If an origin requires a break, it requires some relation to what had been there before, which in turn might be offered up just as legitimately as a heritage site. The ideal heritage must emerge without this marked break, organically, naturally, and inevitably. What had been there before must just vanish or give way, like the Native Americans before the white man, while the heritage itself is, again, ideally, not so much selected as just felt. My final point in this abstract tour of the problem of “heritage” is that a heritage site offers immediate and authentic access to the uniquenesss of a particular heritage. That is, a heritage site is a non-reproducible, originary site, distinct from the mass-produced simulacra of transnational capitalism. The heritage site, being singular, cannot be exchanged. A heritage designation protects ways of life against lifestyles, enjoyment against exploitation. Visitors to a heritage site are able, for a time, to actually be somewhere by being in a place and time that cannot be found anywhere else, one that the modern world has “passed by.” By getting out of sync with the present, visitors to a heritage site can feel more connected. In this sense, heritage is about marketing, scarcity, and nostalgia, and also about the preservation or generation of community in the face of the increasing obsolescence of small communities. 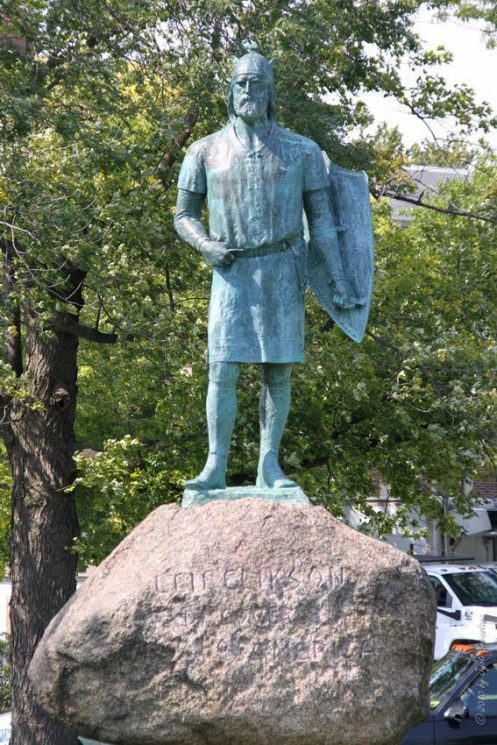 Consider the Kensington Runestone, discovered in 1898, a hoax (for example) witnessing to Nordic, Christian exploration of Minnesota in 1362, and to the massacre these Norsemen suffered at the hands of the natives, a point whose obvious implications I’ll come around to in more detail later. 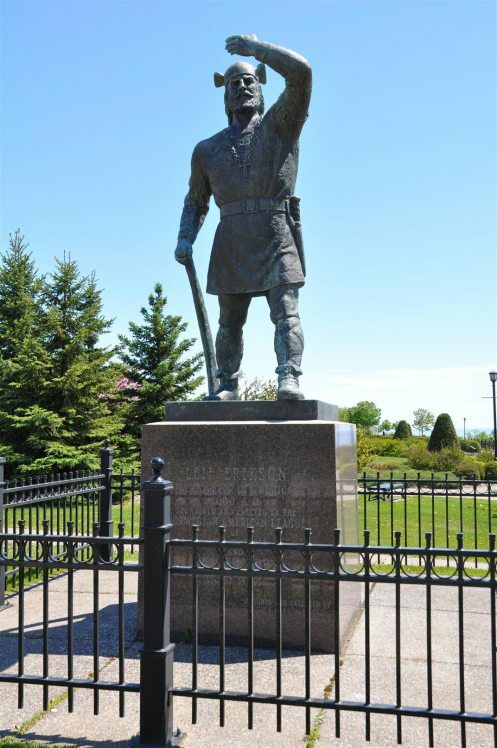 I can briefly mention the equally obvious matters of ethnic pride: the stone was turned up, and maybe produced, by a Swedish stonemason during a period of particularly intense Scandinavian immigration into the American Midwest, so the stone’s discovery is a kind of beacon to Scandinavians that they, more than any American immigrant group, belong in the Midwest and by extension to America. The continued pride — or performance of pride — gives the small Minnesota towns associated with the runestone a continued reason for existence in an era of intensified small-town poverty (cf 1; 2): thus Kensington Minnesota, population 292, features an Our Lady of the Runestone Catholic Church, located on Runestone Drive, while nearby Alexandria, Minnesota, population 11,000, devotes a museum to the runestone itself, and greets visitors with Big Ole, an outsized statue of a Viking.